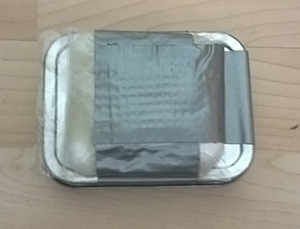 The survival Tin. Like many, I stumbled across the idea of a survival tin reading The SAS Survival Guide by John “Lofty” Wiseman. I read this book (almost cover to cover) when I was a young Sea Scout. My brother had a copy of the book and I was fascinated by the book’s subject matter. Years later, when I started to become more interested in outdoor activities, the memory of Wiseman’s survival tin surged back and I knew that this would be something I would prepare for my own “adventures” outdoors. What is a Survival Tin? The idea of a survival tin is to have a small, easy to carry and lightweight survival kit that contains items that will help in a survival situation. The challenge of creating a tin is to produce a personalised kit that suits you. 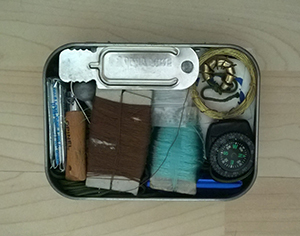 In America, it’s often an Altoids tin that is used, in The SAS Survival Guide, Wiseman suggests a tobacco tin – 2oz size. It’s this size tin (I got hold of several for general storage from The Bushcraft Store. They’re available in gold or silver. Paul Kirtley has an interesting article on survival tins and the fact that a bushcraft kit is probably more useful. 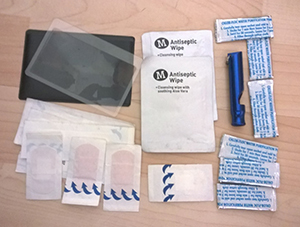 I keep this separate from my Every Day Carry kit – because in my day to day life, living in the midlands of England, it is extremely unlikely I will find myself in a situation requiring basic survival kit. Why Even Have a Survival Tin? Well, when I do get out into the wilds (which is nowhere near as often as I’d like), I take my survival tin in a pocket. Although unlikely, it’s not impossible that I find myself in a survival situation and in need of some of its contents. The tin does duplicate items that are either in my Every Day Carry or in my belt kit, but personally I would rather duplicate a few light items than lose a bag or pouch and find myself (for example) with no means of creating heat in a survival situation. Additionally, I have enjoyed the challenge of deciding what I should carry in a survival tin and making those items fit in a small tin. As you’ll see I have cheated a little by expanding the tin, but the kit I have put together still fits nicely in any of my jacket pockets, a pocket of my hunting / fishing vest or the pocket of my trousers. 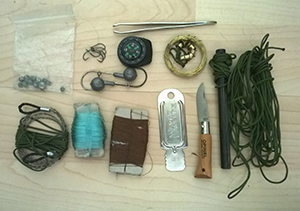 Here’s what I’ve included in my own survival tin. Occasionally, I do tweak the contents … but I think this collection of items will be fairly static for the time being. 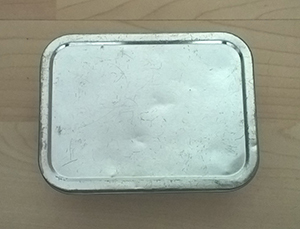 The tin itself is a 2oz Tobacco Tin in silver that I picked up from The Bushcraft Store for the sum of £1.95. Magnifying Glass: Bought on ebay. Credit card sized plastic model in black slip case. Ferrocium Rod: with micro paracord neck loop. Bought the rod on ebay. Striker for Ferrocium Rod: taken from a Light My Fire rod bought who-knows-where! Wire saw (wrapped in micro paracord to keep small): This one from The Bushcraft Store, priced £3.50. I took the loop handles off as sticks can be inserted for handles. Micro paracord – Approximately 5 metres: I bought 100 feet for £3.95 from The Bushcraft Store. Snare Wire and Snare Hoops: bought on ebay. Fishing Line – wrapped around off cut of cardboard): Bought a roll of wire in Decathlon and removed a good length for use in the tin. Fish Hooks – Large (2): Again bought from Decathlon. Fish Hooks – Small (6): Ditto. Fishing Weights in tiny Ziploc bag: and again! 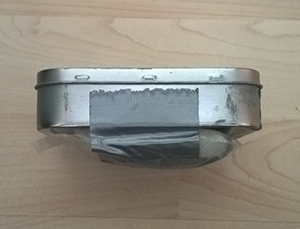 EDIT: 2016-07-29: I’ve now also wrapped teh entire tin with three wide elastic bands – this is to help keep it shut if ever I pack it poorly but they could also come in useful. That’s what I currently have in my tin. I do tweak it occasionally as I read more about the subjects of survival and bushcraft or as I spot new and interesting items of equipment. I only added the Opinel No. 2 knife to the kit the week before writing this post and the safety pins were added after I took photos of the tin for example. I’m also keenly aware that I have no light source (I’m on the lookout for a really slim and compact pencil torch) and that the medical kit included is extremely limited. Many people also suggest salt and sugar sachets as essential items for countering dehydration and energy hits. I’ve omitted these because I don’t think I have space without sacrificing something I truly think I would need but also – as mentioned in the introduction – I live in the midlands of England and it’s unlikely that I would be in a survival situation long enough to really require such items. I should probably include some duct tape (removed from a role and re-wrapped on a flat item it becomes compact) but I wouldn’t be able to close the tin and again, don’t want to sacrifice any of the other items … at this point in time, at any rate. The contents of a survival tin should be considered by the owner, but I hope this insight into my own will inspire the creation of more tins amongst any readers!